strength and durability. Steel crossbeams are located at the proper support points to ensure maximum surface plate accuracy. request and at an additional charge. Stationary stands come with leveling adjustors with the typical adjustment being 2". 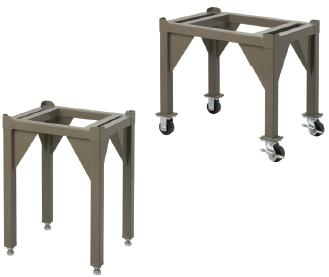 Rolling stands are fabricated with two stationary and two swivel castors. Stands require no assembly. Order by surface plate size.